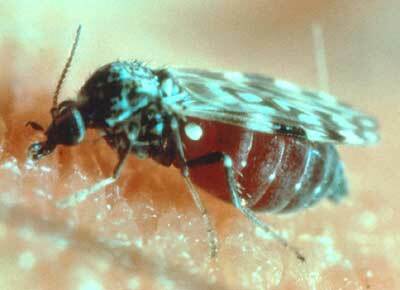 Adult: Biting midges are 1-6 mm long. The body is elongate and dark coloured. Head: The head is small and rounded. The proboscis is modified for piercing and sucking. Antennae are long and filiform in females and plumose in males. Eyes are large and greater than half the size of the head. Thorax: All legs are similar. The forewing is long with scales along the margin and veins. Hindwings are modified into halteres (small knobs at the base of the forewing). Wings are held scissor-like over the abdomen at rest. Adult females lay eggs in clutches of varying number to several hundred. Individual eggs are typically small, dark, slender and covered with minute projections (ansulae). Eggs are deposited in water or moist habitats which periodically become flooded. Larvae with 11 body segments, well-developed head capsule, but legless. Ceratopogonidae are called biting midges (Scotland), No-See-Ums (America), Punkies and Sand Flies (Caribbean and Australia). Ceratopogonids occur in moist habitats, including heavily fertilised areas frequented by livestock. Adults attack vertebrate and invertebrate species to obtain a high-protein meal. Both sexes visit flowers and take nectar. Females require a protein-rich meal for egg maturation. Can vector diseases such as blue-tongue to sheep, onchocerciasis to cattle and horses and filariasis to humans. A1 Pest Control is an established pest control company with a great reputation and many return customers, if you want to find out why everyone loves our work so much call us up on 0417 251 911 or contact us via online messenger and we can get back to you.